Clean Air Engineering's CEM Heated In-Line Filter & Pump Assembly is for use in emissions testing and chemical analysis. Maintaining a steady temperature around 250°F is important to ensure that moisture, acid gas, and other constituents of the gas stream do not condense before entering the analyzing equipment. This can result in the damage of equipment as well as the loss of important data. The Heated In-line Filter and Pump Assembly helps to ensure the accuracy of gas samples by providing a heated route for the gas before analysis. The filter, stainless steel needle valve and pump are insulated and heated. This unit includes a dual heater controller. All components are modular and therefore easy to service. This unit is also small and lightweight which makes it easy to carry around. For use in: process monitoring, stack testing, CEM, gas and diesel sampling. 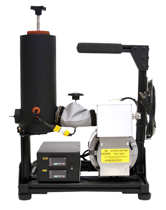 The in-line heated filter holder with a heated ADI sample pump for gas sample delivery. This combination can be used with an extractive FTIR system or other hot CEMS in order to provide a particulate free, hot sample flow for your measurement system. 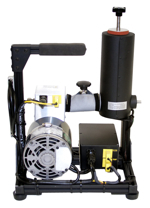 Click the button below to add the Heated In-Line Filter Pump Assembly to your wish list.